This project was created on 04/22/2016 and last updated 2 months ago. Engineers use servo motors to achieve the precision motion required in applications such as robotics, automation, and CNC manufacturing. Like RC servos, industrial servos actively correct for external disturbances. Unlike RC servos, industrial servos can provide very accurate motion, and often support advanced motion control modes. Unfortunately the cost of industrial servos is prohibitive to the individual maker (thousands of dollars per motor). We&apos;ve been developing an affordable open-source industrial servo motor, opening the door to sophisticated mechatronics applications. Our design leverages the low cost of mass produced stepper motors. We are able to achieve very high resolution via 14b encoder feedback (after calibration routine!). For more information, including demos of our working prototypes, check out the external links (below to the left). Missed the Kickstarter? Mechaduino is available for pre-order here! Open to customization. Outside of our firmware, we see Mechaduino as a very useful hardware package. If you would like to use the stepper motor in open loop mode w/ encoder to verify location, you can do that. We also see could see Mechaduino as an educational tool. Since all the hardware is on one board (sensor, processor, motor driver), set up time is very low, and students can focus on playing with the controller. An industrial servo motor can be broken down into four main components (below). First we looked at each of these components and tried to piece together an affordable breadboard-level prototype. After some experimentation, we were able to distill out a working lineup of components. From there, we&apos;ve been iterating on our design, working out all the kinks, and tuning the control loops. It&apos;s starting to come together! 1) The actual motor, usually of the brushless dc variety. When you look at industrial servo motors, a big chunk of the cost is the motor itself. They are often custom built, or at least built in limited quantities, which means $$$. Watt for watt, I&apos;d guess that a mass produced NEMA 17 or NEMA 23 stepper motor is between a tenth and a hundredth the cost of the BDC motors used in industrial servos. Although their design is optimized for "stepping," stepper motors are really just 50-pole brushless dc motors. They can be controlled exactly like a more traditional 3 phase BDC motor with more poles. So that&apos;s the plan. It&apos;s working! 3) Drive circuitry/power electronics to excite the motor windings. Many industrial servos use discrete H bridges. Each phase requires it&apos;s own H bridge ( for a two phase motor... half bridges for each in a three phase motor), which consists of at least 4 if not 8 (...including freewheeling diodes) discrete switching devices. Throw in gate drive circuitry, and things start to get expensive. We hoped to find a single-chip, integrated solution that would allow for current feedback, and we found just that in the A4954 dual full bridge PWM driver. Hardware Available & New Firmware! After dealing with some parts shortages in 2018, We&apos;ve finally completed another batch of Mechaduinos! We also released an update to the firmware! The calibration table can now be stored in flash memory! The Mechaduino Manual has also been updated (links below). The updated Mechaduino 0.2 PCB kit is now available for purchase here. A list of updates is available in the latest version of the Mechaduino Manual, and all source files are available on Github. We have another batch of Mechaduinos in production that will be available for purchase on our website in a few weeks. Sorry for the delay. We decided to add a couple of improvements to the boards which slowed things down a bit. We will be posting details about the improvements shortly in an updated version of the Mechaduino manual. We&apos;ll upload the updated source files to github as soon as we&apos;ve polished them up. We&apos;ve uploaded a significantly improved version of the Mechaduino firmware. It is available here (master branch of our repo). Older versions of the firmware are still available here and here. -Ability to adjust PID gains from menu (does not use non-volatile memory yet, so you do have to update firmware for permanent changes, but this makes tuning a lot easier). 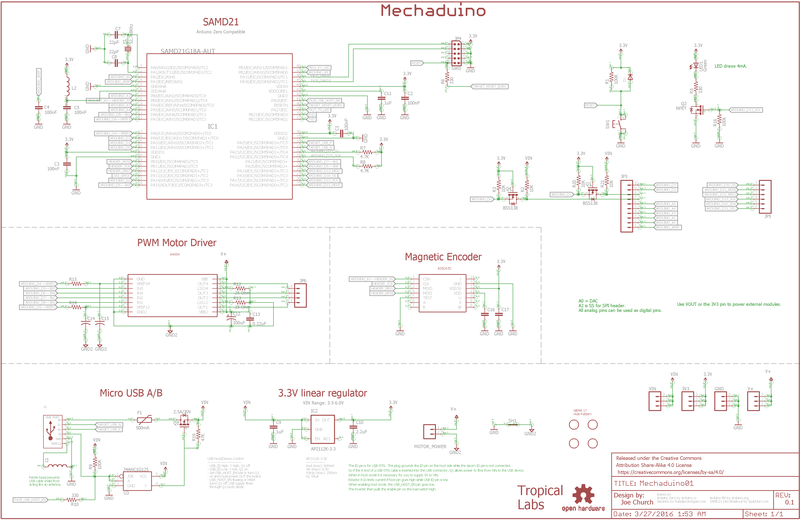 We are almost ready to release a Mechaduino Manual that covers hardware, firmware, and example code. Please stay tuned! First, run the calibration routine and copy the lookup table in to parameters.cpp. In this example we use the position mode &apos;x&apos;, and increment/decrement the setpoint based on the pin state. You could also use the velocity mode &apos;v&apos; and set the setpoint to a velocity based on the pin state. This motion was implemented as shown below. "r" is our global setpoint variable. Since the control loop is implemented using interrupts, you don&apos;t really have to worry about it in your main loop once it is enabled! If you ordered Mechaduino hardware through our Kickstarter, you should receive your reward any day now (If you haven&apos;t already)! Sales from our website should start to appear next week! We&apos;ve also heard from quite a number of folks who couldn&apos;t wait and built there own! If you would like to share your Mechaduino applications or design modifications, please feel free to post below in the comments! We began shipping our Mechaduino Kickstarter rewards this week! From the beginning, we have seen Mechaduino as a way to make motion control for automation accessible. Industrial motion control systems are pretty far outside of the budget of most makers and small businesses. By creating an open source servo motor that is affordable and programmable in the familiar Arduino environment, we hope to give makers a powerful tool to design their own automated systems. As a simple example, here&apos;s how we used a Mechaduino to help us automate the assembly of (you guessed it!) Mechaduinos! For each motor, we need to replace the stock screws with our custom screws/standoffs. This fixture helps to streamline the process. Though simple, we estimate that this fixture saves us about 10 seconds per motor... that adds up when you have to repeat a process 1000 times! Here are some preliminary instructions on how to get your Mechaduino up and running. ASSEMBLY: You will need to mount the magnet to the back of the motor shaft. Note: the magnet must be diametrically magnetized, as opposed to axially magnetized. The magnet may naturally stick to the shaft, but we recommend a dab of epoxy or super glue to hold it in place. The magnet should be fairly centered, but the calibration routine will correct for minor misalignment. The Mechaduino PCB must be mounted so that the magnet is directly under the encoder chip (Very close but not touching. See the AS5047 datasheet for details). We replaced the standard motor hardware with M3 threaded rods and short standoffs to mount on our Mechaduinos, but there are other ways this could be done. When wiring your motor up to the Mechaduino board, please make sure that one phase is connected to ouputs 1&2, and the other phase is connected to phases 3&4. Hi this is great project. Can it used EMF Monitoring ? I developed a derivative of the original Mechaduino: https://hackaday.io/project/27823-highpower-mechaduino. It can drive stepper motors up to 500W, and includes some nice improvements based on the original design. Very cool branch! It looks as though the uStepper team probably also derived some inspiration from this. Has anyone attempted to utilize a RISC-V core in something similar? At the moment it seems as though most of the FOSS stepper motor controllers are still using ARM, and there are RISC-V Arduino compatible boards for under $100USD now (circa early 2019 for spacetime venturers who may be reading this from a vantage of excessive latency), and Linux compatible ones for closer to $1000USD. I see there are some Arduino powered CNCs for about $150USD, and presumably overhauling their servo motors with Mechduinos or something else FOSS with a closed loop error detection/correction would be an improvement as a minor upgrade, but RISC-V iterated Mechduinos seem potentially even more open/easier to reuse/relicense/etc. in the future. If no one else does it, then I will explore it myself and share what I come up with, though it may be a while at the moment I am still primarily in the research phase of the CNC overhaul project. Well got every thing working is there any special stuff i need to do after setting up step and dir. Hi! How can this be implemented with a n linear optical encoder? Is there a control mode whereby the stepper shaft can spin freely with no resistance ? How much does the board weigh? For a 3d printer, I&apos;m curious it it would make sense to drive a small motor on a direct drive extruder for more precise extrusion or use a bigger motor open loop instead. I have a feeling that a small motor driven efficiently would be better and overall lighter. Regards and thanks! Hi, this is great project. i make out by my own. but the calibration lookup table is too big... cause the firmware overflowed by 137840 bytes... (samd21 only have 256k flash)... i have no idea how to resove this problem... who can help me? and PCB Assembly factory,we wish can do something for you,would glad to provide the free PCB Prototype and PCBA Prototype for your further research. Hi! I&apos;ve read your current github code. I don&apos;t get how you&apos;re doing the adaptive behavior (letting a person turn the shaft). How do you determine when a human is interfering? how do you separate that from the torque of, say, gravity, or some other object attached to the shaft? Thank you! Why not using driver A4988 or DRV8825 please? In a step/direction retrofit application, I assume the servo will fail to work properly unless the position loop tuning is good enough to keep the settling time very short - shorter than the step input period. Is this simply a matter of good tuning, or is there a better way? It would be really nice to get this down to a couple of milliseconds or better. - Does auto-tune capability exist or do you need to do it by hand? I see you have a step-response serial dump feature which is useful, but it is still a tedious and patient process to get the control loop optimized. Is separate tuning of the position-mode PID and velocity-mode PID required? Is there a particular procedure that you find works well for PID tuning the system? - 3.3V on the AS5047 fixed. I have a question about the schematic. On the AS5047 the design doesn&apos;t have pins VDD and VDD3V3 connected. The data sheet (Figure 10) recommends connecting these pins when in 3V3 mode. is there a reason these are not connected? What are the electric specifications for the mechaduino? I think of power supply voltage range, logic input voltage range, maximum output current and stepper motor internal resistance range? I think these details would be really helpful for new users and should be mentioned in the details section. My x and y axis jitter and vibrate during printing, z and extruder don&apos;t exhibit any noticeable problems. I just read that Smoothboard uses 3.3 volt output on the step/direction/enable pins. Is the 3.3 volt output an issue for Mechaduino? I&apos;m also keen on an answer for this as I&apos;m also using a Smoothie. Hi guys, has anyone looked at using the new A5995 driver from Allegro? It&apos;s a bit of an upgrade (3.2A) , but different packaging. I am working on a 8A version for NEMA 23 motors. Is it possible the add a velocity loop inside the position loop? Is the code for examples like the toilet paper disbenser available? I got my motors a while ago but just starting to play with them now. Please see our latest build log (above)! Arduino + geared stepper motor control of microscope XY stage and focus. Inspired by need for an amputee to do veterinary lab work. You are about to report the project "Mechaduino", please tell us the reason.